You’re probably familiar with search engine optimization (SEO). Chances are that you’ve hired an automotive marketing agency or website provider to optimize your dealership’s website at one point or another. You may even have a large enough team to develop and execute an SEO strategy in-house. It’s one thing to consistently drive traffic to your website, but it’s another thing to keep them engaged. This is where your website’s user experience (UX) is crucial. The UX on your auto listing or dealership website should take the stress out of vehicle shopping and make it easy for consumers to find their next vehicle. If you’re finding that your website isn’t getting as much traction as you’d hoped, conversion rates are low, or overall vehicle sales are low, it may be time to reassess the UX on your website. You could have the most friendly receptionists, the smoothest sales team, the most impressive showroom, and even the best F&I department in town, but none of that matters if no one is there to experience it. The average vehicle shopper only visits 1-2 dealerships before making a purchase. The fact of the matter is that most of the vehicle research and buying process is done online today. 85-90% of auto shoppers conduct online research, according to a MillwardBrown study. And 64% of online vehicle shoppers compare different models as part of the process, according to a recent study commissioned by Cox Automotive. 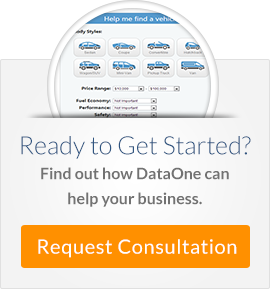 Still many auto listing and dealership websites do not offer a comparison tool, or have buried it on their website. Today’s vehicle shoppers are much different than vehicle shoppers pre-internet. You’ve probably heard this more than you can recall, yet still, many consumers are not satisfied with the current car shopping process. Your potential customers are looking for an efficient vehicle shopping and purchasing experience similar to the rest of their shopping experiences. Ride- and car-sharing are two services that have really blown up over the last few years. The ability to conveniently and affordably arrange for a ride or book a vehicle right from an application on your smartphone is too good not to catch on. Many sources believe that ride- and car-sharing are presenting a threat to the auto industry, primarily OEM and dealership sales. Though the industry will change, they certainly are not doomed! Over the last 5 years, there has been a paradigm shift in marketing and advertising across all industries. The "spray and pray" method, hammer everyone with promotional content and hope it sticks, is finally fading, as businesses become more strategic in their messaging.